Join us for the opening celebration of the Henry’s latest exhibition, Cecilia Vicuña: About to Happen. Enjoy drinks and conversation and be among the first to see the exhibition. Musical performance provided by noted cellist Gretchen Yanover, in partnership with Earshot Jazz. Drink tickets will be available to purchase for $5. Members receive two free drink tickets! Not a member? Join here. Let us know on Facebook if you're planning on coming! The Henry is a place for all visitors to enjoy, learn, and be inspired. The museum is fully accessible by wheelchair, and we strive to provide services and accommodations for anyone who needs assistance. Please email contact museumservices@henryart.org with particular needs or concerns you may have. If you need ASL services, please make your request two weeks in advance of your visit. Cecilia Vicuña (Chile, born 1947). Balsa Snake Raft to Escape the Flood, 2017. 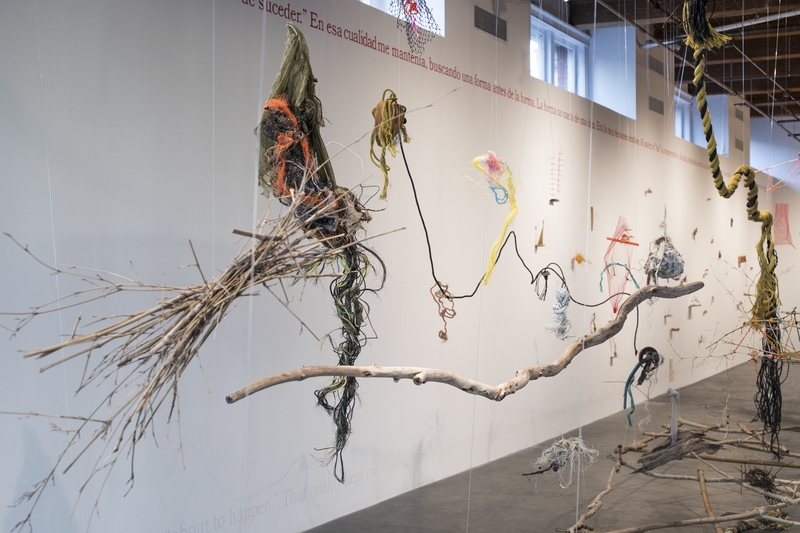 Site-specific installation with found materials sourced from New Orleans, Chile, and New York: debris, bamboo, willows, twigs, fishing line, beads, rope, net, styrofoam, plastic, and feathers. [Installation view, Cecilia Vicuña: About to Happen, 2017. Contemporary Arts Center, New Orleans.] Photo: Alex Marks.